With its new hardware design and improved, powerful digital signal processing it surpasses any other non-intrusive ultrasonic flowmeter in terms of accuracy, reliability and versatility. 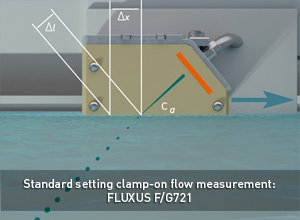 Highly sophisticated signal filters, faster than ever processing capacities and substantially improved measurement algorithms make the FLUXUS F721 liquid flow meter a state-of-the-art measuring solution even for the most challenging applications. The meter adapts itself automatically to the respective measurement conditions and compensates for disturbances such as beam dispersal and structure-borne noise, allowing for even more precise and reliable measurements. Extreme fast measurement cycles allow for precise real time monitoring of highly dynamic processes. As the flowmeter of choice for a very wide range of applications in virtually any industrial sector, the FLUXUS F721 is available with two different enclosure types: aluminium housing for standard applications and stainless steel housing for operation in highly corrosive environments. The stainless steel product variant is certified for usage in hazardous areas (ATEX, IECEX Zone 2, FM Class I, Div. 2).